Reminder! Get your soup on! The Super Souper Challenge – The Roundup! It’s that time of year again. No, I’m not just talking about feeding your face and drinking too much "punch". It’s the third annual Menu For Hope, created by Chez Pim. Last year’s campaign was a runaway success, raising over $17,000 for UNICEF. This year, the Menu For Hope will benefit the UN World Food Programme. I am sponsoring a prize for Menu For Hope! Graciously donated from Savor (my favorite foodie store in Atlanta), a divine bottle of Apple Cider Balsamic Vinegar and a bottle of Argentinian first press organic Extra Virgin Olive Oil. Also, from Savor, a delicious tomato/onion/raisin accompaniment for cheese & a honey and gingerbread Dijon mustard. Three pestos and spreads made by Atlanta-based Bella Cucina: Roasted Eggplant (this stuff tastes so smokey and Mediterranean – divine! 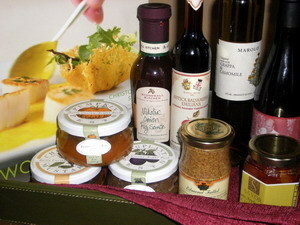 ), Sweet Pumpkin Pesto, and Chestnut Honey Mustard. A wonderful and original cookbook called Working The Plate – recipes that are accompanied by plating techniques and food styling tips from the chefs themselves. Last but not least…a bottle of chamomile-infused Grappa that I first tried on my trip to NYC. 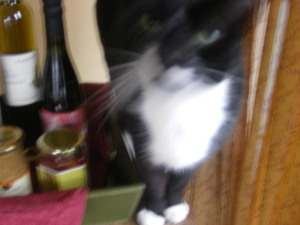 It was so spectacular – and unlike anything I had ever tasted – that I bought two bottles: one for you and one for me! All told, this collection is worth around $170! It’s a great way to get involved with such an amazing blog event. Now that you know the details of *my* contribution, go ahead and get started! To bid specifically on my gift, enter the code UC08. Each region has their own collection of donations. To see everyone from the "Central" region, please visit Kalyn’s Kitchen. To see all of the prizes that have been donated, remember that they can all be seen at Chez Pim’s Menu For Hope III post. The campaign will run from December 11th through December 22nd. The results and winners will be chosen randomly through a nifty program written by a fellow food blogger and posted on January 15th, 2007. If you have any other questions that I can help clear up after you read the instructions below, please feel free to email me at runningwithtweezers@gmail.com. 2. Make a donation, each $10 will give you one raffle ticket toward a prize of your choice. Please specify which prize or prizes you’d like in the ‘Personal Message’ section in the donation form when confirming your donation. Do tell us how many tickets per prize, and please use the prize code -for example, a donation of $50 can be 2 tickets for UW01 and 3 for UW02. The code for Running With Tweezers’ gift is UC08. YUMMMMM! I bid on a couple things, two tickets for yours! Wish me luck! Great post. I noticed your package has already been bid on by several people too! Anyway, I’m updating the prize post with the permalinks and just wanted to say thanks again for being so generous. We’ve raised over $4,000 already!